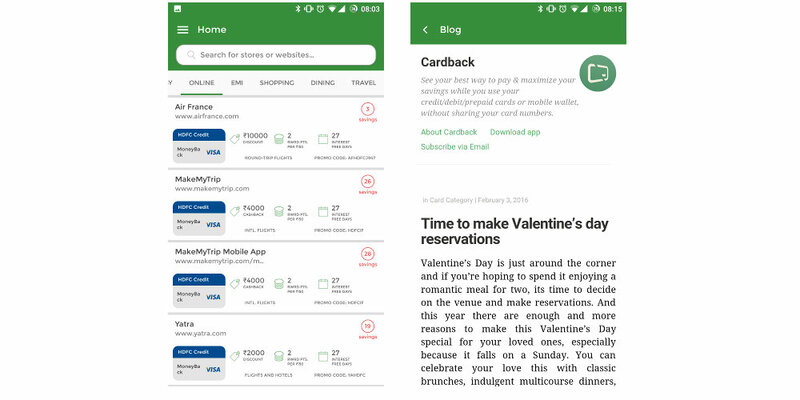 New Delhi based startup, Orangut Labs build a product known as Cardback which gets you the best deal around at ease. Most of us have a bank account today which is accompanied by a debit card at-least. Some of us, opt for a credit card as well. It’s an era for electronic money and we know that when startups who brought mobile wallets are growing huge. We often come across various offers via paying online/offline through these different payment methods. So how to get to know the best one for you? Managing the offers is currently available differentiated by different payment methods. Cardback is bringing this data on your mobile device customized for your needs. One needs to add his/her card type and issuing authority which includes banks in order to run the personalization engine running for you. This data will be stored against your profile creating using OAuth mechanism by Facebook and Google. This question which first comes to our mind was is this data even secure? Why should we give our details to Cardback? Well, this works in a give and take process. You give out your details and they keep it securely on their servers so that it always remain in sync and so that they can probably use it in future for targeted promotional offer distribution. Another thing which clears that you should worry about your cards is because you are not entering your credentials. It’s just the issuing bank along with card type for debit/credit cards or the organization issuing mobile wallet. Does this work with PayTM, Mobikwik and other mobile wallets? Hell yeah. 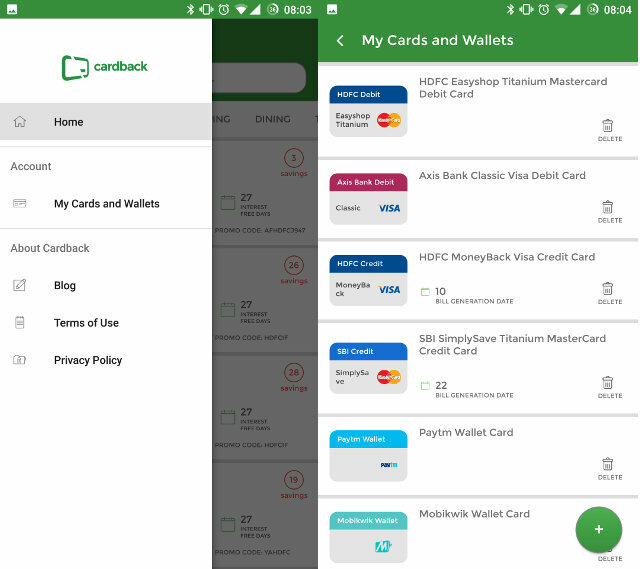 It works with the popular mobile wallets including PayTM, Mobikwik, Freecharge, PayU wallet and Citrus. Oxygen is not included yet but you do even use Oxygen? The app is available for Android, iOS and Windows Mobile smartphone operating system. Unfortunately, we have tried only the Android version because being on #teamAndroid. We really dig deep into the app specifics to make sure it is not one of the leechers which takes up all the juice from the smartphone. Analyzing the application on how it works, we observed that it initialize the setup wizard asking you to sign up using Facebook or Google account. We think this being a good strategy because being an application, when we have our accounts signed in its better to make the user least tasks so that he/she does not bounces back on the first view. After the sign up process is complete, the app asks you to enter your card type and issuing authority so that it can save it for you and show offers that are beneficial. Once done your initial setup is complete. You will now be at the first view of the signed-in application. You will asked to choose the offer type and the location where you want to look for an offer (only valid for offline deals). The online deals would be managed by card types only and offer type to cut down the clutter. The app has a pleasant user interface with okay-ish user experience. Coming from the previous app version which was actually not so good clinging to your resources, we think they have improved a lot but there is more room to grow, a little on the user experience side. The app’s dependency on location services can be a little annoying running in background throwing you deals in your area even when you don’t want it. My complaint here is even though I have disabled notifications, why do I get toast notifications about the app not able to get my location. Other than this, I guess the app consumes it fair share and comes to use whenever we plan to spend. I used to forget about the app and that’s why it got a fixed corner on my home screen. Overall useful, nifty app that can have a more improved user experience. This service currently works in Delhi-NCR, Mumbai, Bangalore, Hyderabad, Pune and Chennai. We aren’t sure how Orangut plans to expand this product, but let’s see what comes down the road. Got any suggestions or something they can include share with us? Share with us and we will try to make it happen.